As each morning dawns, there are those who are marginalised only by virtue of violent circumstance. Those who now take upon the barest of chances to seek change from the sharp vicissitudes that have become their lives. They: those huddled masses who seek legal asylum on our shores, voices often lost in the sea of political rhetoric; their stories washed away by the tide of information; their earnest pleas stranded upon the sands of closed minds and personal opinion. In response to this dire situation, 16 Australian rabbis from all streams of Judaism have expressed concern at the current treatment of people lawfully seeking asylum in Australia who arrive by unscheduled sea voyages. While recognising the challenges and complexities resulting from increased refugee flows, they call on the Australian government to observe its obligations under international refugee and humanitarian law. The following statement was signed and endorsed by the notables below. We are deeply concerned about the plight of people seeking asylum and refugee status in Australia who are being held in offshore detention. We are particularly concerned at this time about the psychological and physical welfare of some 267 men, women and children currently in mainland Australia, who face the prospect of being returned to offshore detention. Judaism commands us to recognise the vulnerability of strangers among us and to treat them with respect and dignity, indeed with love, because our people have often been strangers in a strange land, and have stood where they now stand. 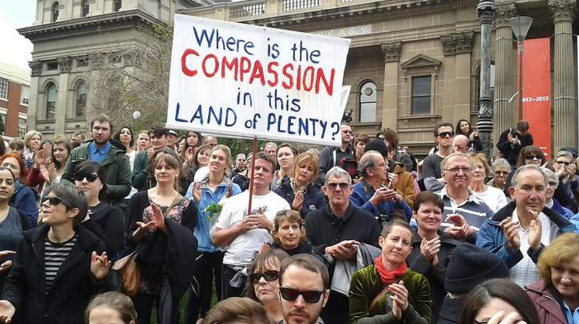 We recognise the moral, practical and legal complexities caused in our region by global refugee flows but urge the government of Australia to act with empathy and compassion towards these most vulnerable people and to do everything in its power to care for them and to reduce their trauma. We call on our government to observe Australia’s obligations under international refugee and human rights law, to ensure the safety, security, and physical and mental well-being of every person who is fleeing from persecution and war and is in need of protection in Australia, to shorten the time it takes properly to assess refugee claims, and to act as a matter of utmost urgency to ensure that no-one is detained under conditions that many experts have said, and some incidents have shown, are detrimental to physical safety and mental health. We stand in solidarity with people of all faiths across our country who have offered protection and sanctuary to people seeking asylum and who support their right to compassionate treatment. We pray for a world of peace and security in which large numbers of innocent people are not forced to flee from their homes.